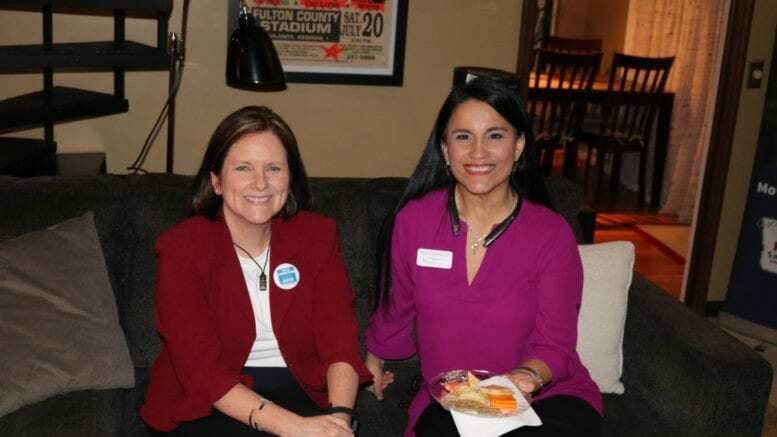 At a meet-and-greet in East Cobb on Friday evening, two Democratic candidates for Georgia state legislative seats outlined their priorities and reasons for running. Karín Sandiford is campaigning for Georgia House District 46, and Christine Triebsch is running for the Georgia Senate District 32 seat. Both districts are in East Cobb, and are currently represented by Republican legislators. Sandiford has lived in East Cobb for over 11 years. She is an engineer and recently graduated from Emory University with an executive MBA. Asked her opinion on the walkout by a group of East Cobb high school students to commemorate the Parkland, Florida school shootings, she said she is supportive of students speaking out and was disappointed at the punitive reaction of the Cobb County school board. Triebsch, an attorney, said that when she previously ran against the incumbent in a special election for SD 32, she received 43 percent of the East Cobb vote and found it encouraging. The Democratic, Republican, and nonpartisan primaries will be held May 22, 2018. Be the first to comment on "Two Democratic candidates for Georgia House and Senate seats in East Cobb talk about their priorities at meet-and-greet"